NEWS FLASH!! 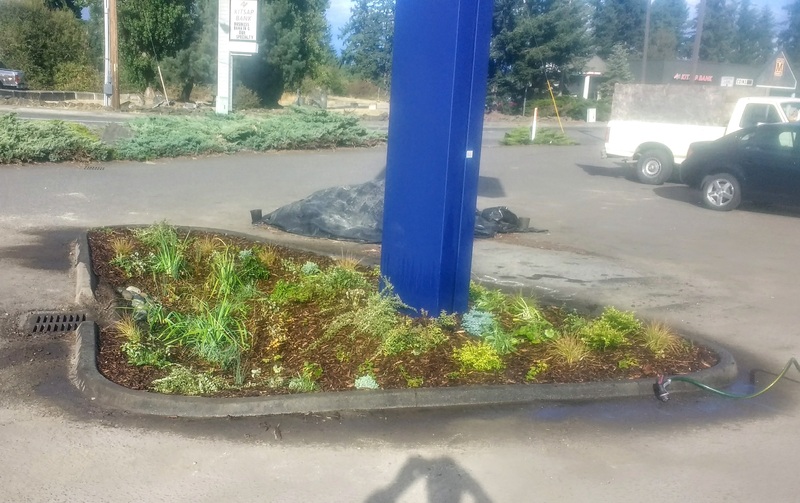 NEW RAINGARDENS at CHETZEMOKA and 1st Security Bank! Thanks to those MRC members who were able to make it out for the rain garden installations and assisted in other ways. They both went in well. It’s great to see concrete work that our project choices and MRC funds are able to accommodate. The City staff (including Judy S. and the Parks staff) were great to work with. We had about a dozen volunteers at Chetzemoka on Thursday, along with our WSU crew of 1 staff and 2 Americorps from our WSU Thurston County Extension and a staffer from our Mason County office. On Friday we had about 45 OPEPO students K-5th grades, who learned about rain gardens and did some final planting and mulching. 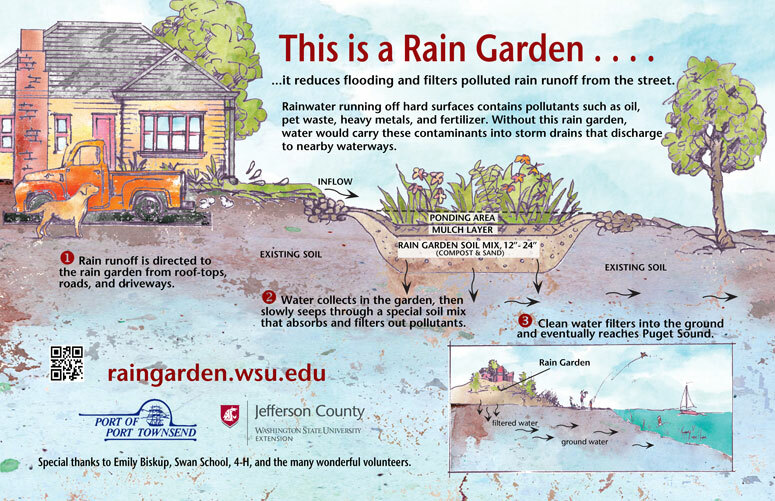 A rain garden is a beautiful and effective way to clean polluted stormwater runoff, acting like a miniature native forest by collecting, absorbing, and filtering stormwater runoff from roof tops, driveways, patios, and other areas that don’t allow water to soak in. They can be built at several scales and one may be just right for your home or neighborhood. Use a special mix of sand and compost that allow water to soak in rapidly and supports healthy plant growth. Stormwater is nothing but rainfall after it falls on the earth’s surface and travels across the landscape to a nearby stream or other water body. In landscapes that have been altered by humans, this stormwater picks up everything we humans leave behind – things like oil and gas, heavy metals, fertilizers, and animal waste. Scientists have confirmed that stormwater is harmful to humans, animals, and fish that come in contact with it. Eventually stormwater makes its way to Puget Sound impairing the Sound’s water quality, impacting our shellfish and fisheries industry, and limiting recreational opportunities. WSU research and experiments have shown that stormwater collected from highways around Puget Sound is lethal to fish. However, when that same stormwater was filtered through a special rain garden soil mix – the fish lived. Rain gardens can be a important tool in limiting the amount of contaminated water reaching our streams and Puget Sound. 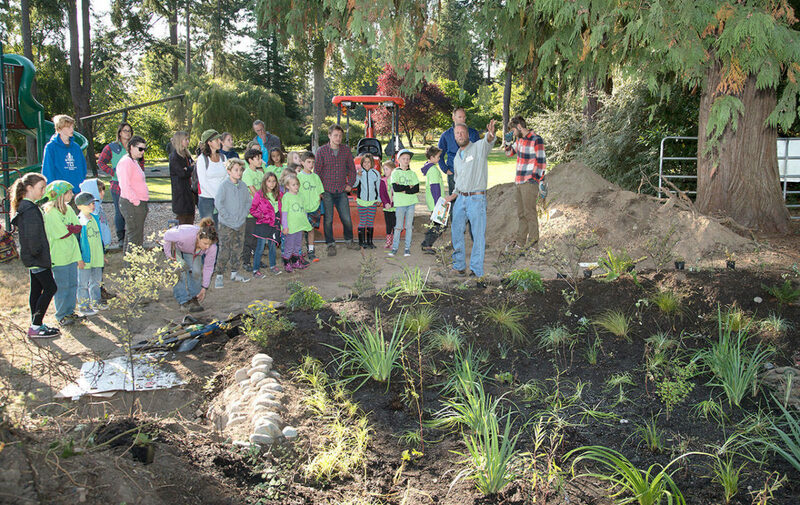 Your first step is to download the free Rain Garden Handbook for Western Washington. The handbook will help you design, install and maintain your rain garden. Be sure to check out where and where not to build your garden. Not every place is suitable. 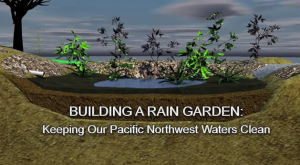 Rain Garden Construction – A checklist for constructing your rain garden. 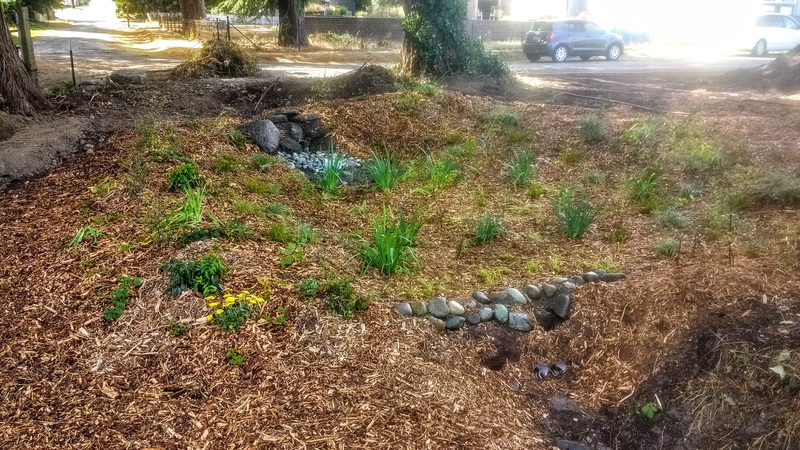 Construction Sequencing – The order of constructing your rain garden. Maintaining Your Rain Garden – Key maintenance tips for your new rain garden. Once you’ve built your rain garden, visit the 12000 Rain Gardens website to register your rain garden and join the countdown toward the goal of 12,000 rain gardens in Puget Sound by 2106. Be sure to check out the interactive map.